If you hear a loud boom, chances are you’d duck, run away, or at least look around. Dogs are no different. Here are four major reasons fireworks make dogs go crazy. 1. If it’s loud for you, it’s 10 times as loud for them! 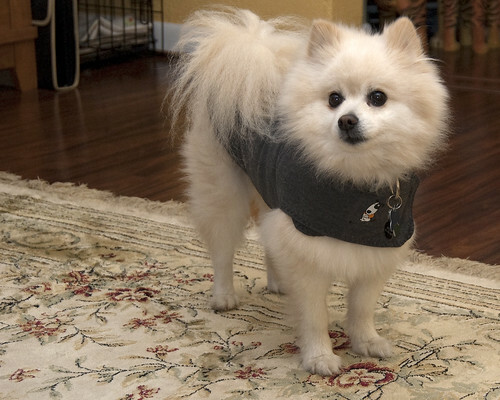 As explained in our article about Poms’ 5 senses, pomeranians have very sensitive hearing. This means that something loud for you will feel many times louder to your pom. Loud booms aren’t something poms experience every day (unless they’re hunting dogs, which Poms usually aren’t! ;-)), so their curiosity and alertness are piqued by fireworks. On top of this poms are especially responsive to noises because they’re descended from watch dogs. Dog owners usually use loud voices to get their dogs excited, which can condition them to respond the same way to other loud noises like fireworks. Celebrity dog trainer Cesar Milan says that most dogs don’t get enough exercise to keep them calm. This can lead them to respond in one of two ways when something new like fireworks occur: expend all that energy by barking and bouncing around, or going into nervous breakdown mode. Here are some suggestions for avoiding a scared, barking pom this independence day. The easiest way to avoid getting your pom worked up is to keep him away from fireworks! You could put him in the house of a friend or relative located away from the festivities, or in a kennel. If you really love training your pom and plan months ahead of time, you can try getting your pom used to hearing fireworks sounds. Cesar Milan says this can take 3-4 months of playing recorded firework sounds at a louder and louder volume before he eats. Sounds like a lot of work if you ask us. No thanks! Sedation is our preferred method in worst cases. As long as you’re careful with dosage, this is the same as sedating your pom before an airplane trip. If you plan to go this route make sure to give your pom the sedative medication several hours before the fireworks start. Another popular device for keeping dogs calm is the Thundershirt, a pressure garment that has been shown to have a calming effect on many dogs and is recommended by vets. You can buy the Thundershirt at Amazon for around $40. Assuming your pom doesn’t have small dog syndrome, he will look to you as the pack leader. This means your pom tries to mimic what you do and how you act. If you stay calm and don’t seem excited about the fireworks, there’s a chance he may follow your lead after barking a while. Of course, some poms (like our pom Yogi) will keep barking in the presence of loud sounds no matter what we did. So if you decide to go the communication route make sure your pom follows commands closely and is not easily excitable (like our calm older rescue pomeranian Ted). How have you kept your pom calm during fireworks? What worked well and what didn’t work well? Please share your experiences in the comments section below!